5. 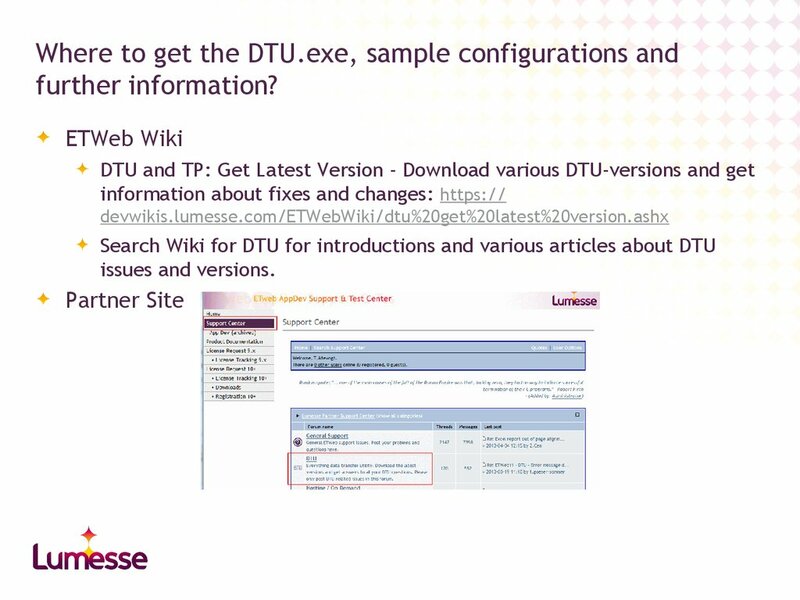 Where to get the DTU.exe, sample configurations and further information? 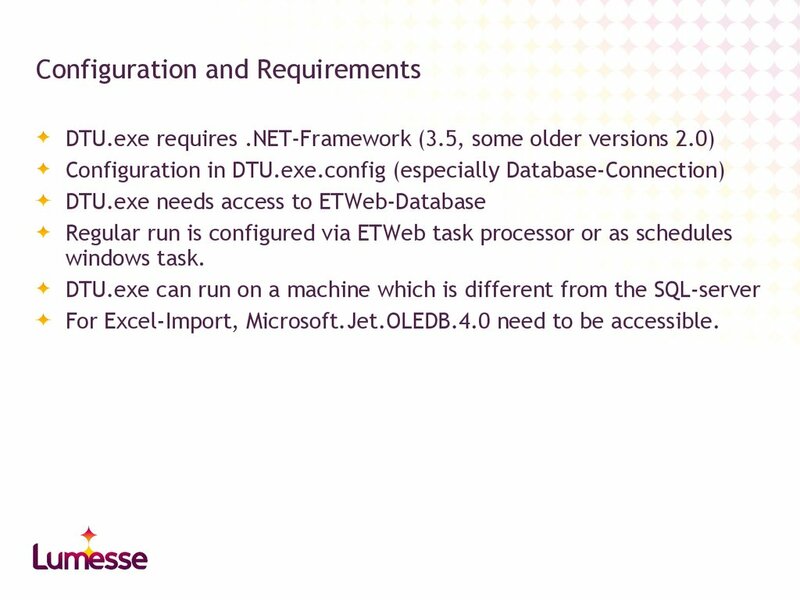 For Excel-Import, Microsoft.Jet.OLEDB.4.0 need to be accessible. Still in use with many older projects for 10.x nowadays. from ETWeb 10.3 onwards (however unofficially). Language-dependent lookups have been changed. Only data changes will be imported. Can be used for ETWeb 10.6 onwards. 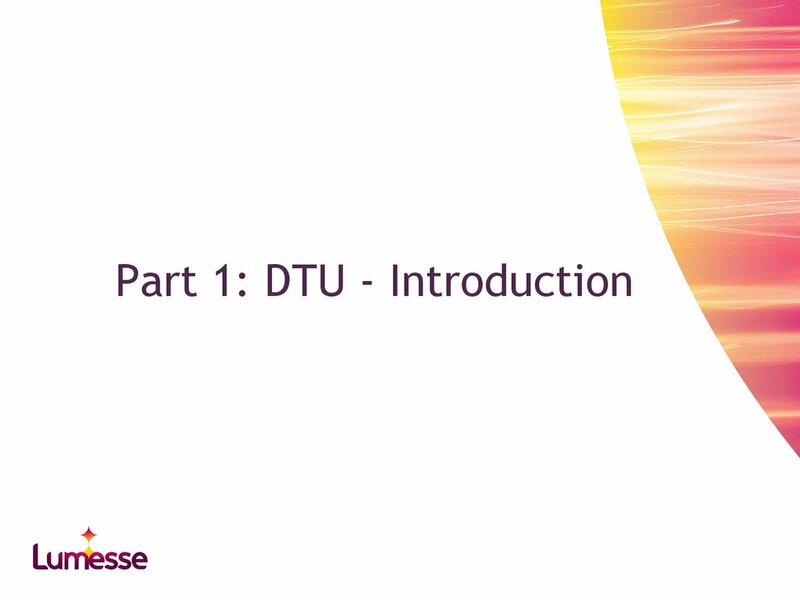 Proper testing of the DTU with the new version is required. pre-staging table. Data is stored in NText-Fields. Optional validation of required fields. Optional validation that a field value(s) is/are unique within the records. 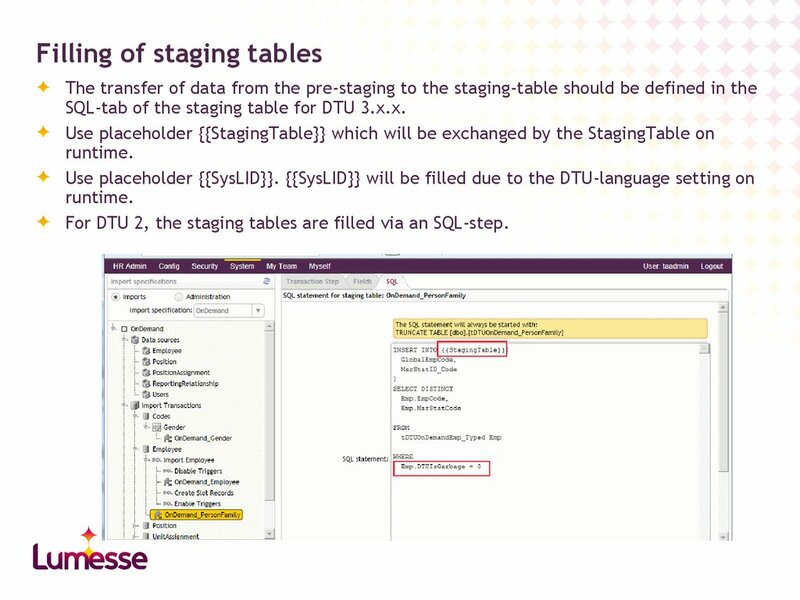 Transfer the data from the pre-staging table to the staging table. 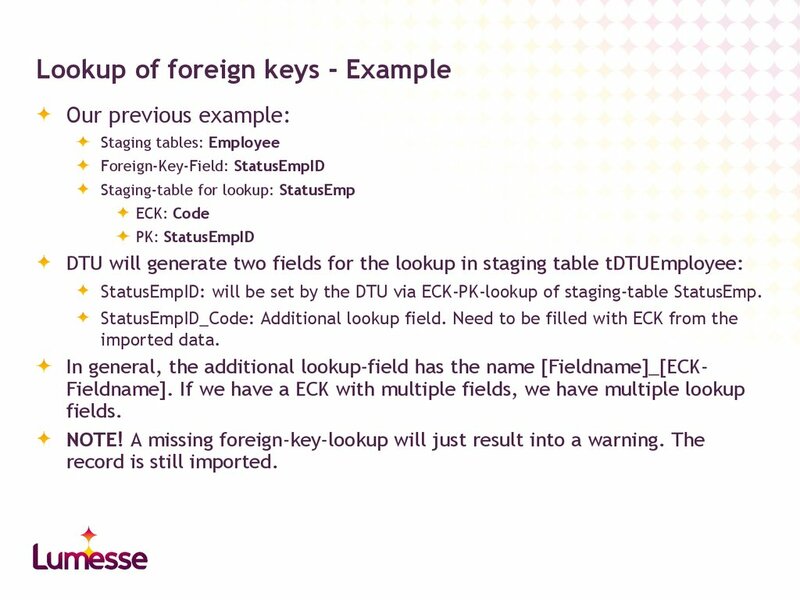 Resolving foreign-key-fields via configured lookups. 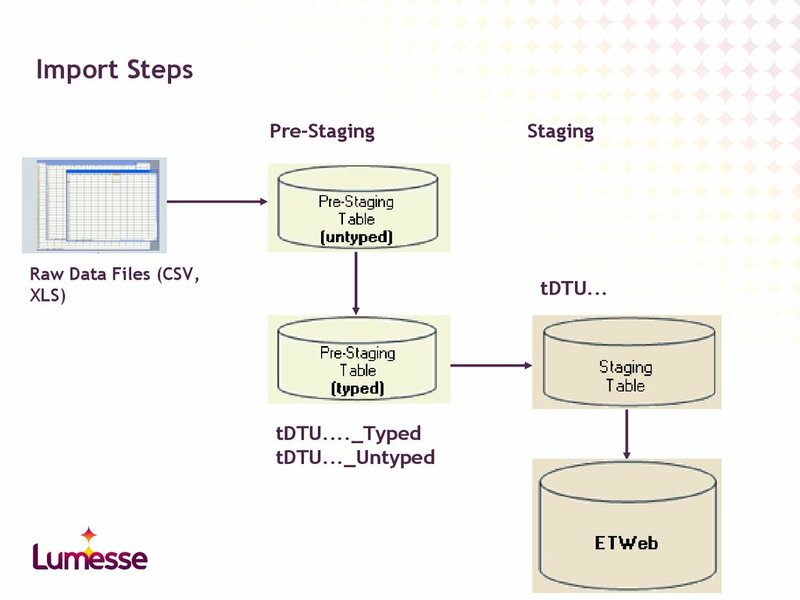 Pre-Staging and Staging tables are created in the build-step of the DTU. 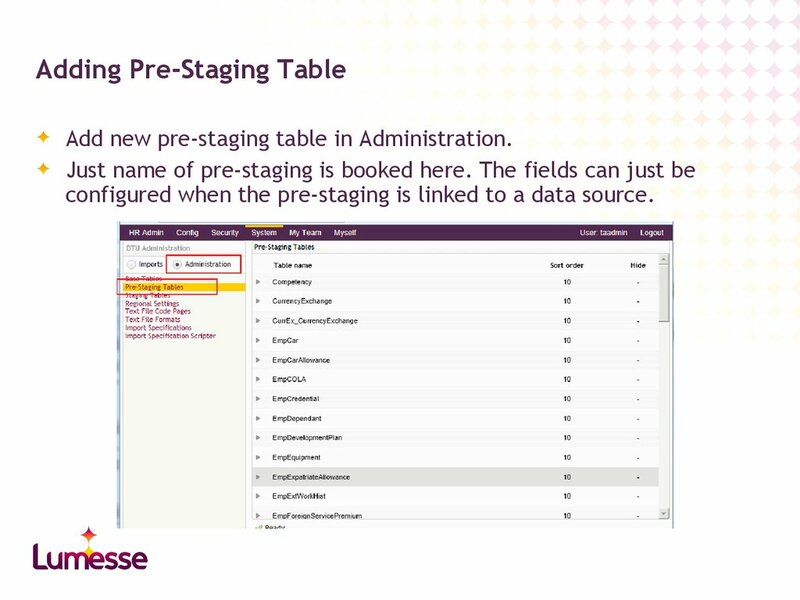 Add new pre-staging table in Administration. configured when the pre-staging is linked to a data source. may be shared among various data sources. added to any DTU in your system. which should be a destination of the import. generated via a trigger, never forget the check 1:1 table. 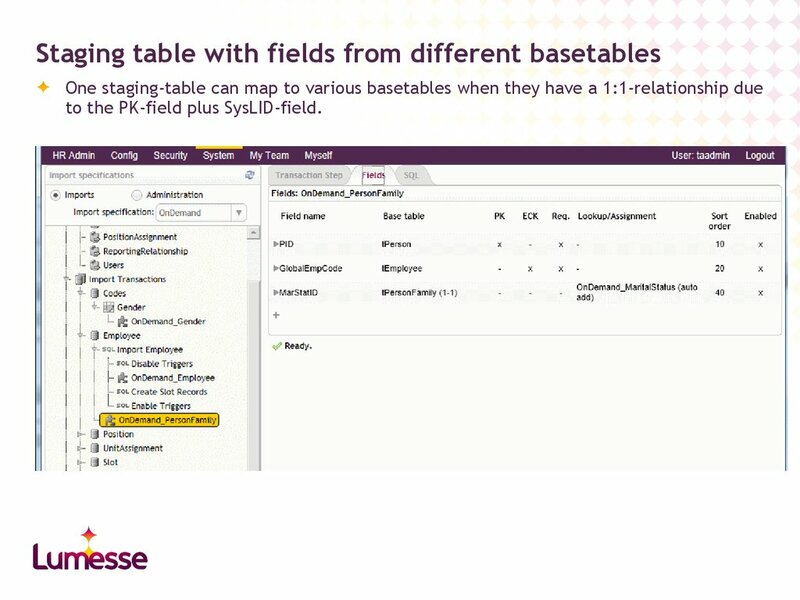 via a mapping of staging table fields and base table fields. 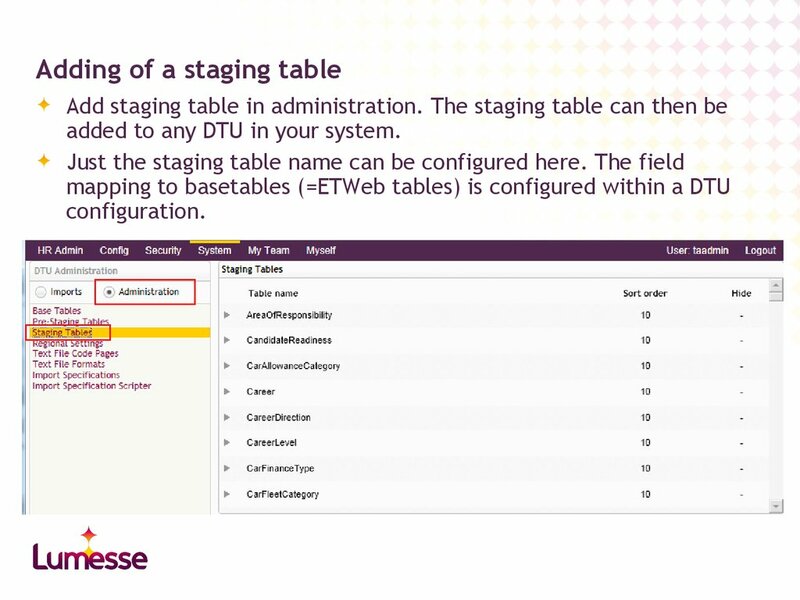 you may need to have staging tables that are just used in your DTU. already exist in ETWeb and just need to be updated. Definition of the rule how to lookup foreign key via imported fields. Note! A staging table can also be used just for one purpose. 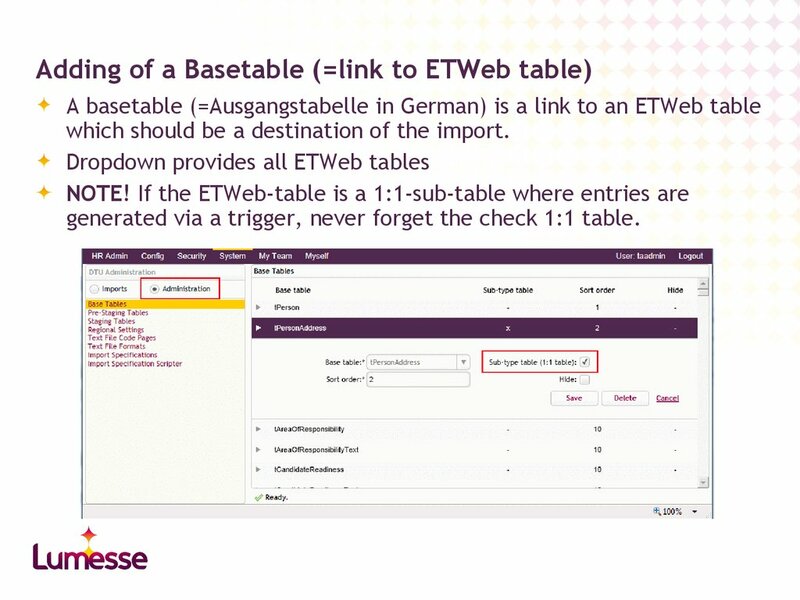 ETWeb?….Let’s talk about PKs and ECKs. Note that also multiple fields can build an ECK. If no corresponding record is found in the basetable, we have an INSERT. configuration (<add key="InvalidateDuplicateECK" value="true"/> in DTU.exe.config). is still NULL when you SQL-statement is executed.). lookup via the staging table StatusEmp. basetable of StatusEmp, the ECK will be added to the basetable. 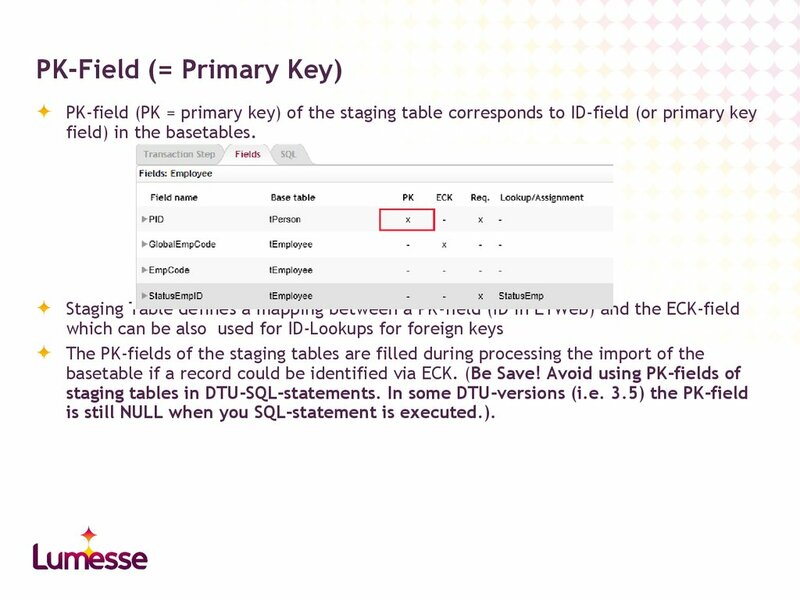 StatusEmpID: will be set by the DTU via ECK-PK-lookup of staging-table StatusEmp. ParentSlotID: is resolved by DTU. 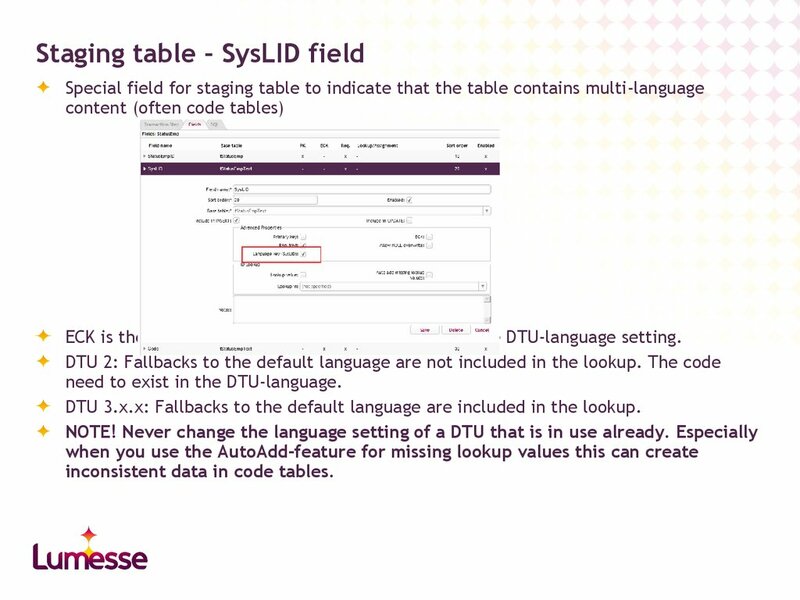 ECK is the Code plus the SysLID which is set due to the DTU-language setting. 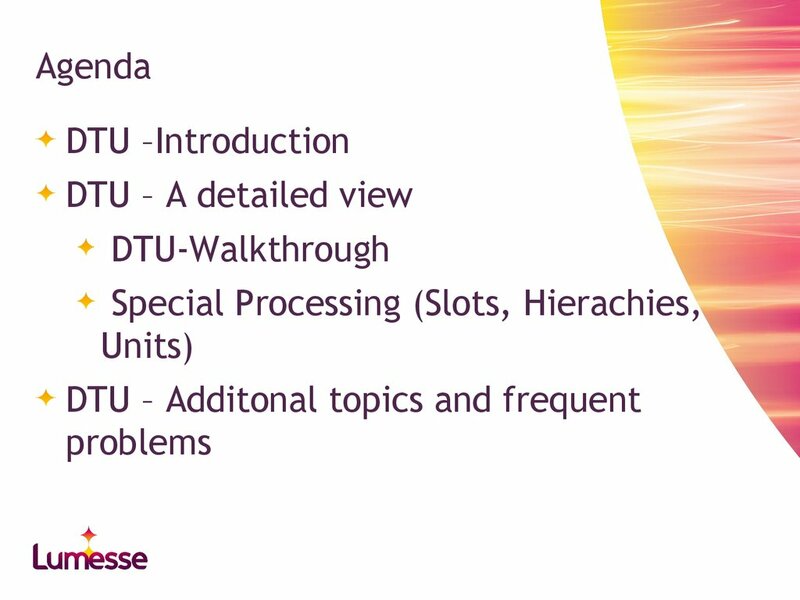 need to exist in the DTU-language. DTU 3.x.x: Fallbacks to the default language are included in the lookup. inconsistent data in code tables. to the PK-field plus SysLID-field. 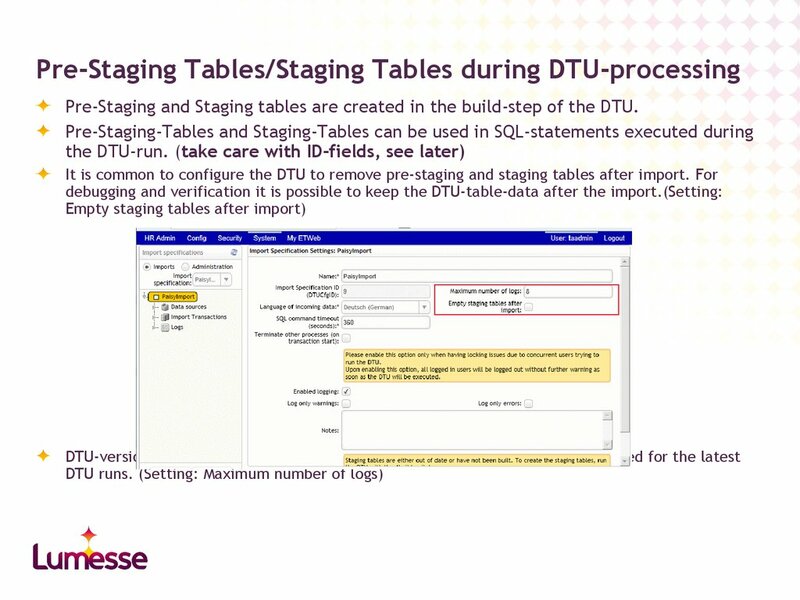 SQL-tab of the staging table for DTU 3.x.x. 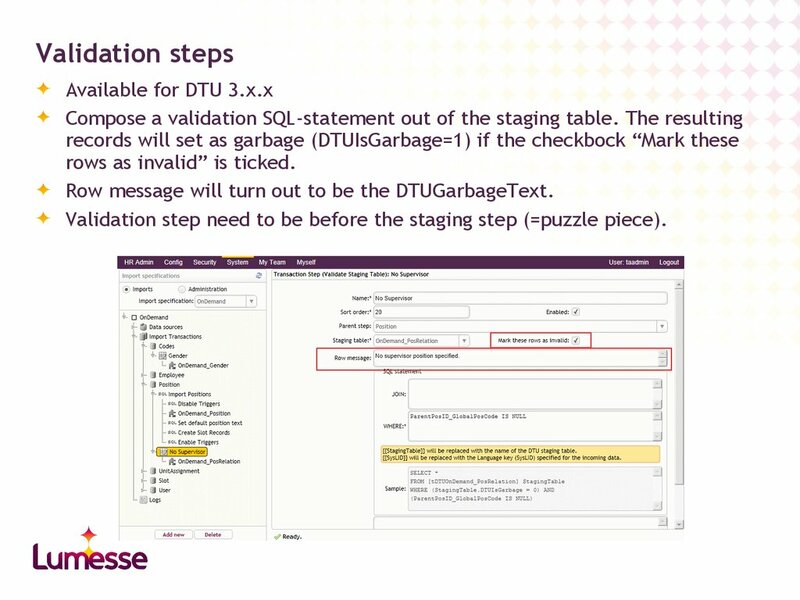 For DTU 2, the staging tables are filled via an SQL-step. commit or a rollback on error. 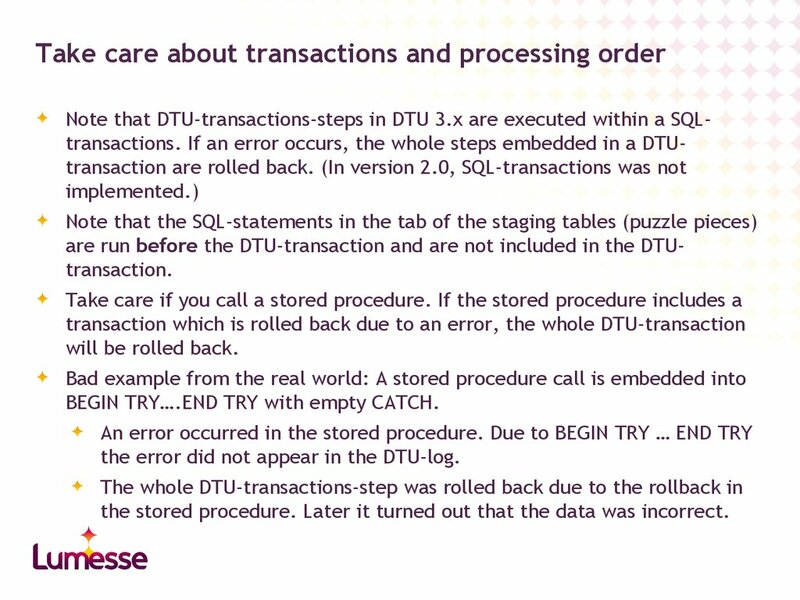 In DTU 2, the transaction was not really transactions. 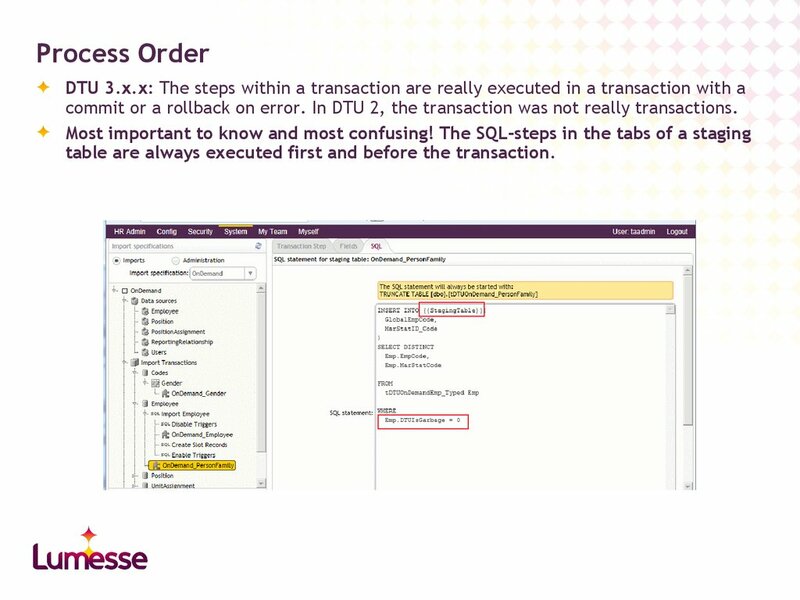 table are always executed first and before the transaction. 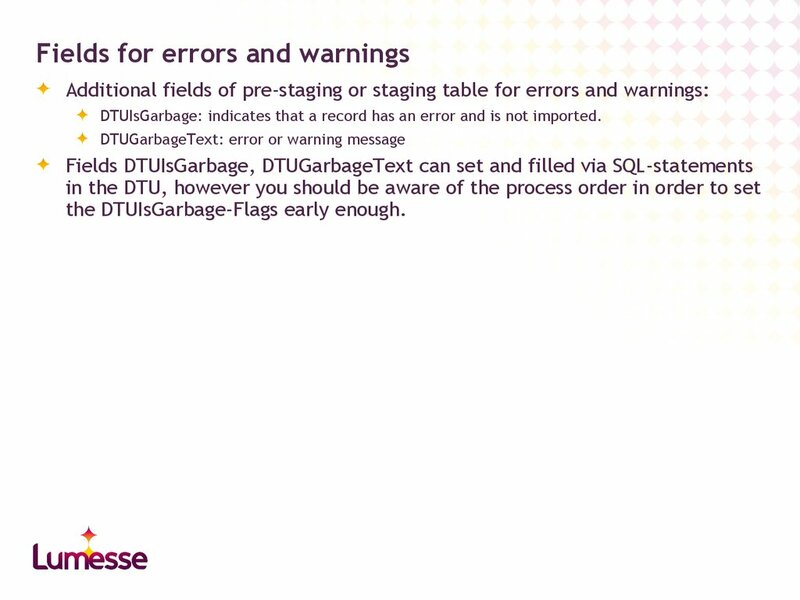 DTUIsGarbage: indicates that a record has an error and is not imported. rows as invalid” is ticked. Row message will turn out to be the DTUGarbageText. Validation step need to be before the staging step (=puzzle piece). Each employee/position is assigned to one or more slots. Each position has exactly one primary employee within the position’s incumbents. special SP which is pzDTUSlotHandling per default. 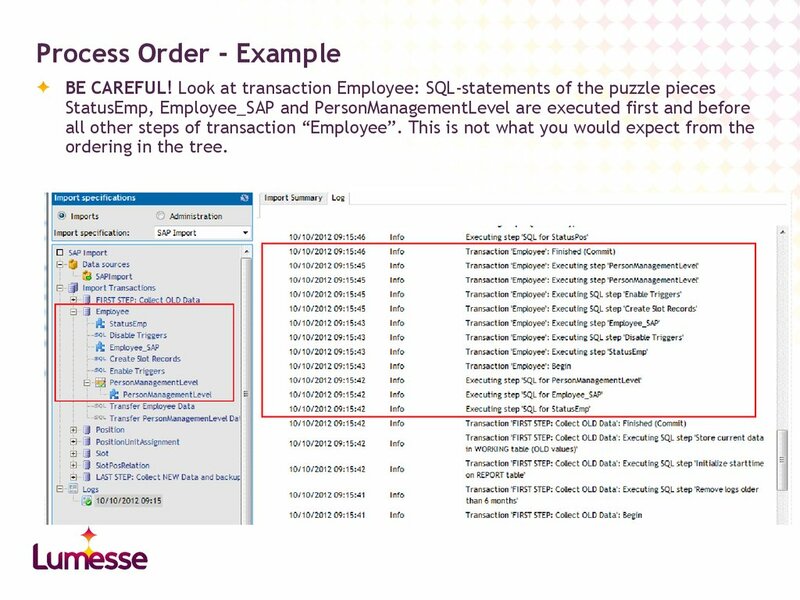 unassignments if “Create Internal Work History record” is checked. SlotHandling cares about the contraints (primary flags) of tSlot-data. which need to be filled from the pre-staging table. PID: configured as a lookup field on staging table Employee (with generated ECKlookup-field PID_GlobalEmpCode for the standard DTU). 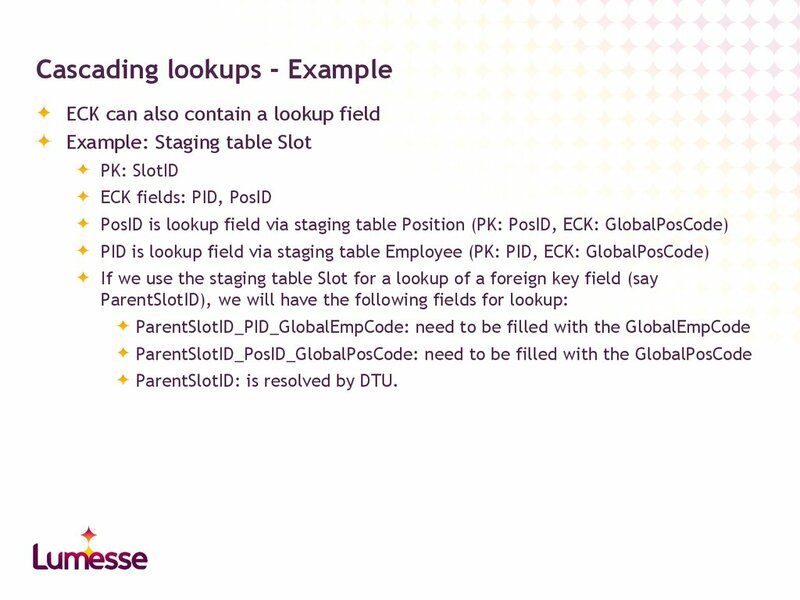 PosID: configured as a lookup field on staging table Position (with generated ECKlookup-field PosID_GlobalPosCode). 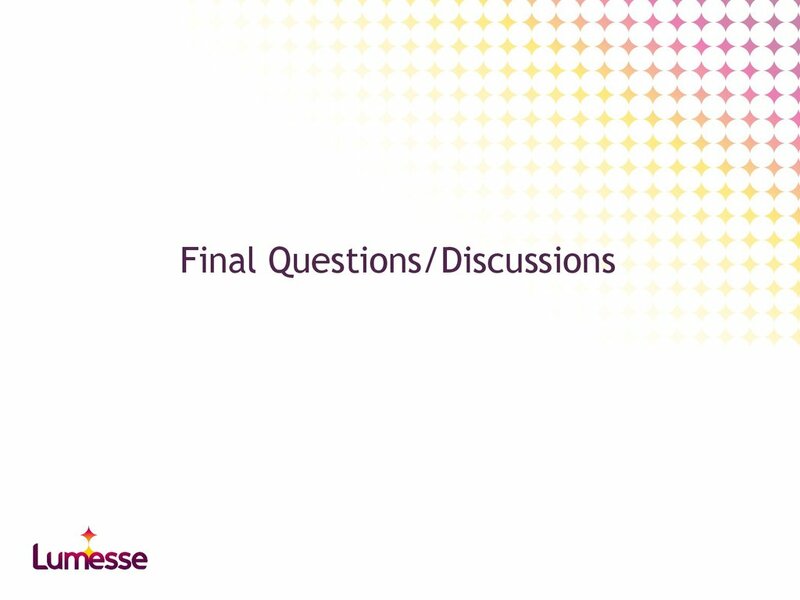 IsPrimaryEmp: employee is primary incumbent of the position. IsPrimaryPos: position is primary position of the employee. is assigned to a new position. 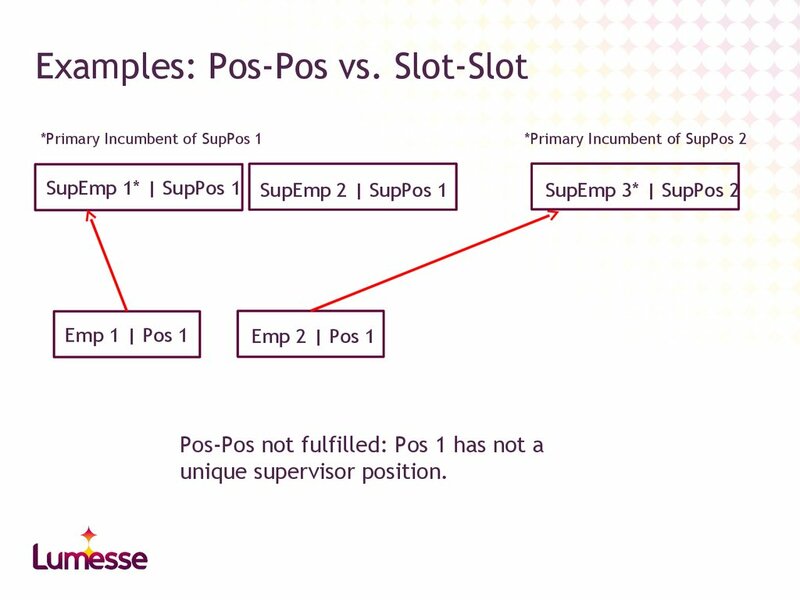 hierarchy is set corresponding to the primary incumbent of the supervisor position. 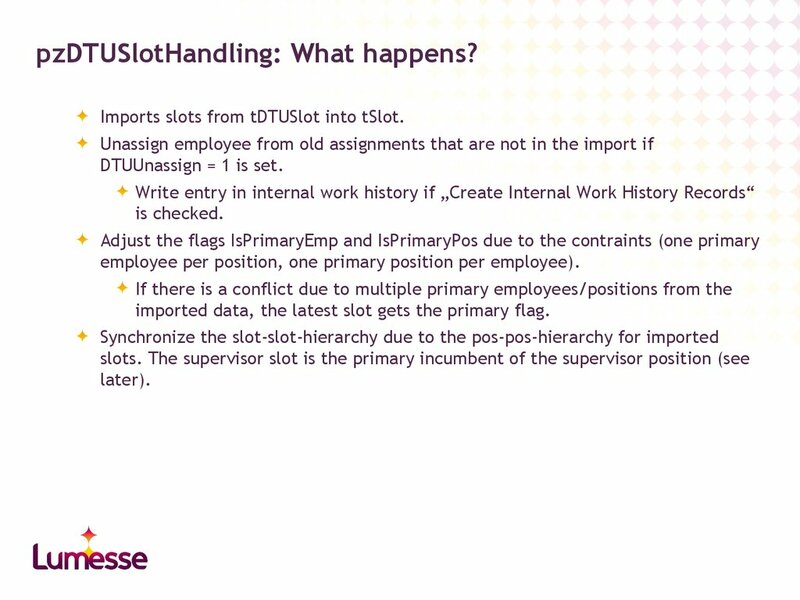 Imports slots from tDTUSlot into tSlot. DTUUnassign = 1 is set. employee per position, one primary position per employee). imported data, the latest slot gets the primary flag. 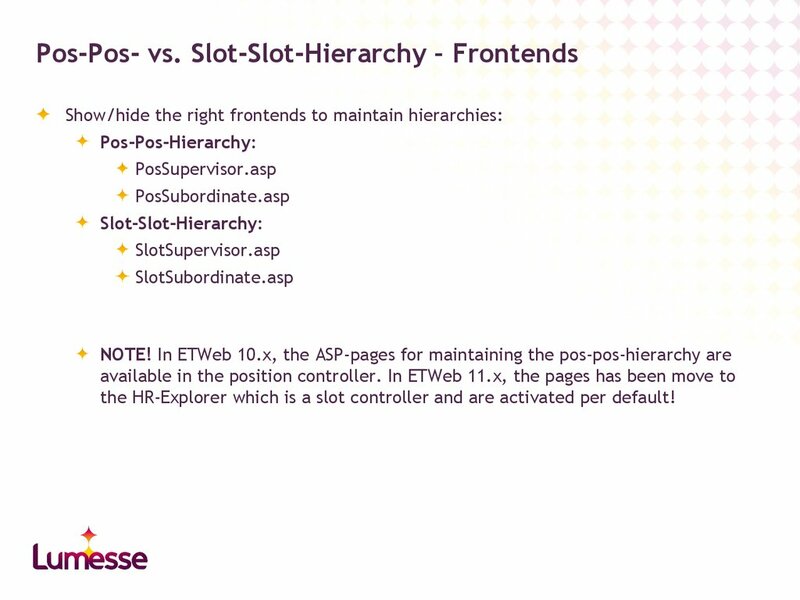 PosHierID to distinguish different hierarchies. Each position has one (or none) supervisor position as a parent position. The supervisor of a position’s incumbant is the primary incumbant of the supervisor position. 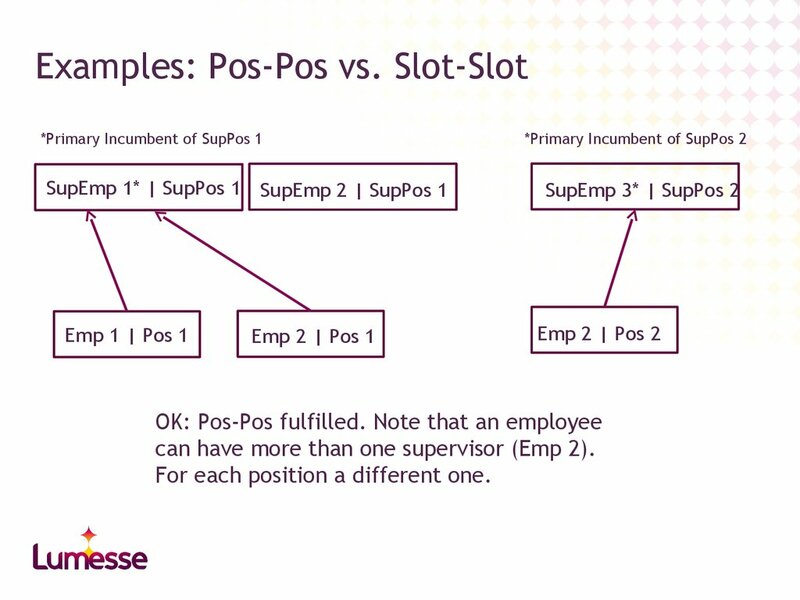 For most companies, a pos-pos-hierarchy is sufficient and the easiest to maintain. 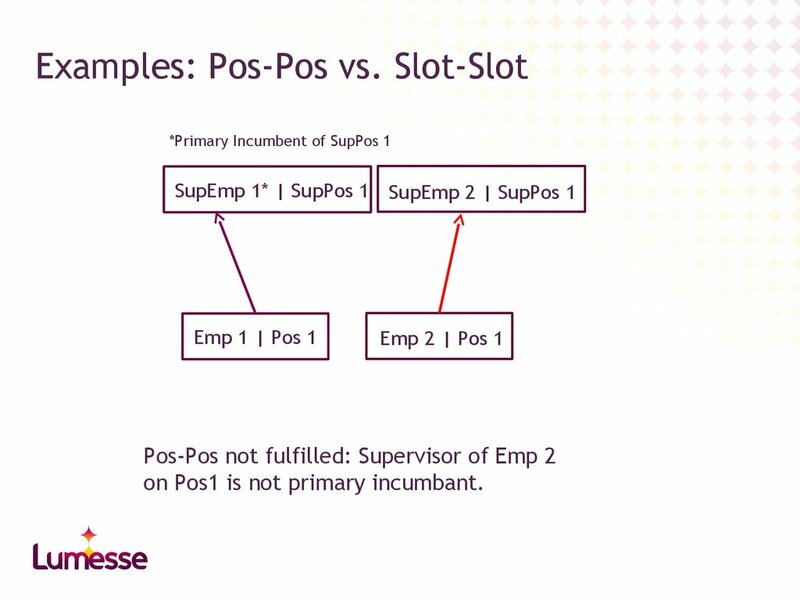 Only one incumbant per position means always Pos-Pos. Each slot has one (or none) supervisor slot as a parent slot. a position, the supervisor and supervisor position needs to be assigned manually. 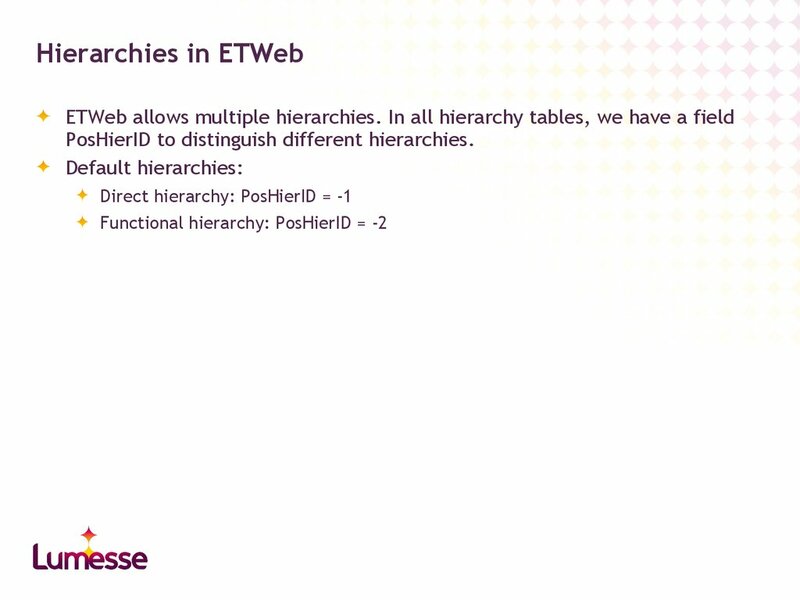 possible to mix up the hierarchy concepts in one ETWeb. on Pos1 is not primary incumbant. can have more than one supervisor (Emp 2). For each position a different one. the HR-Explorer which is a slot controller and are activated per default! Just tSlotPosRelation is used. tPosRelation will be empty. 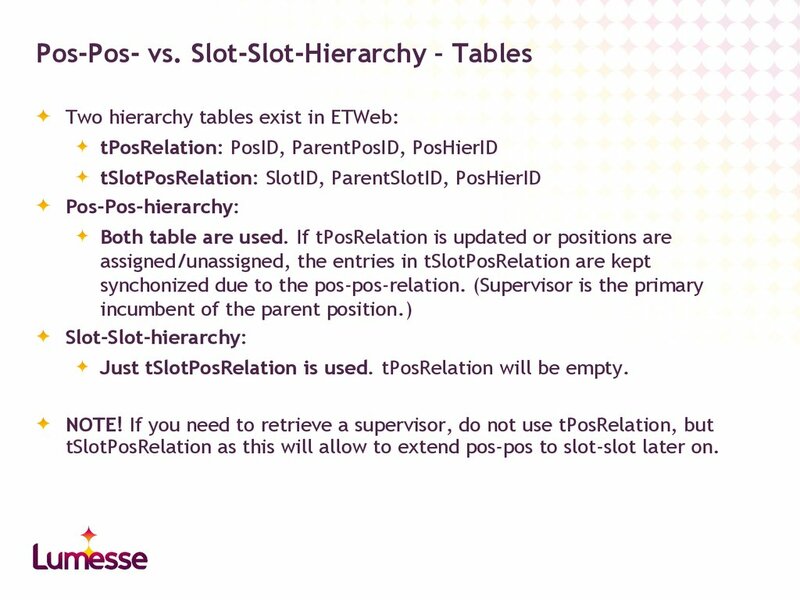 tSlotPosRelation as this will allow to extend pos-pos to slot-slot later on. 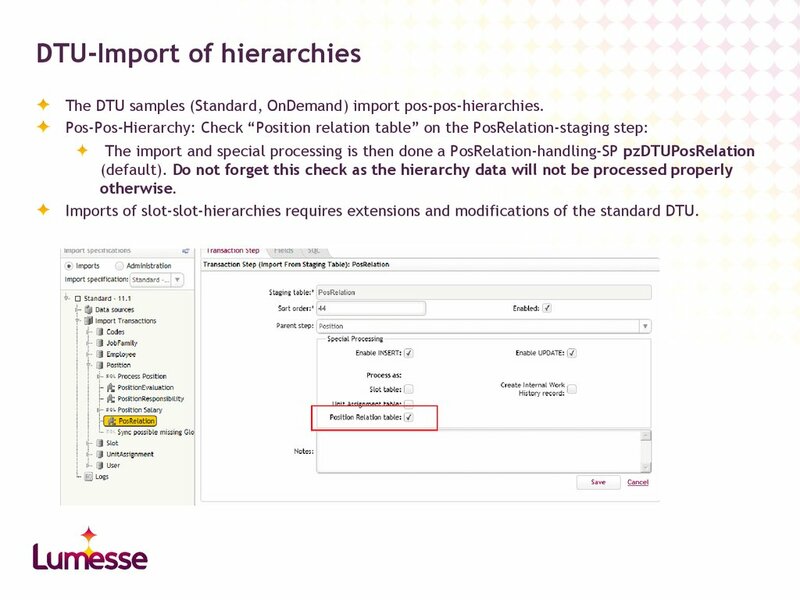 The DTU samples (Standard, OnDemand) import pos-pos-hierarchies. 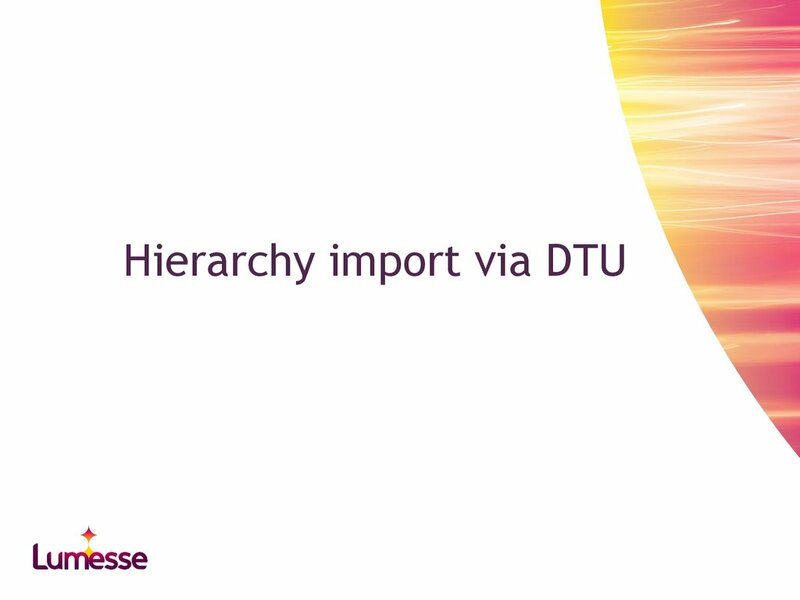 Imports of slot-slot-hierarchies requires extensions and modifications of the standard DTU. Imports from tDTUPosRelation into tPosRelation. 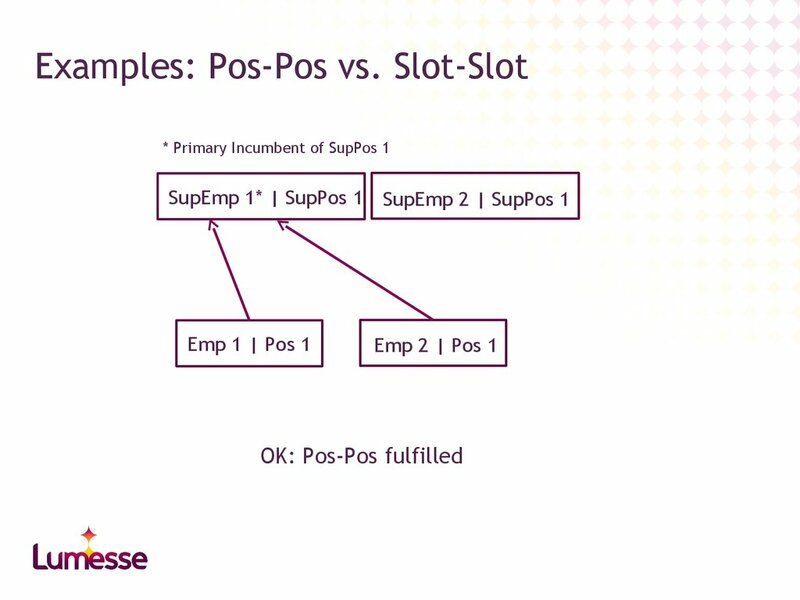 in tSlotPosRelation that deviate from the pos-pos are left untouched. 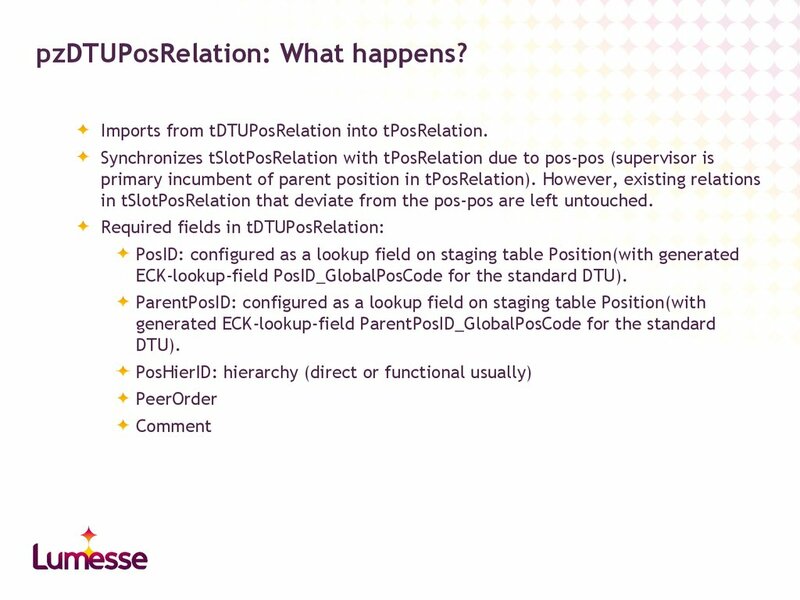 ECK-lookup-field PosID_GlobalPosCode for the standard DTU). 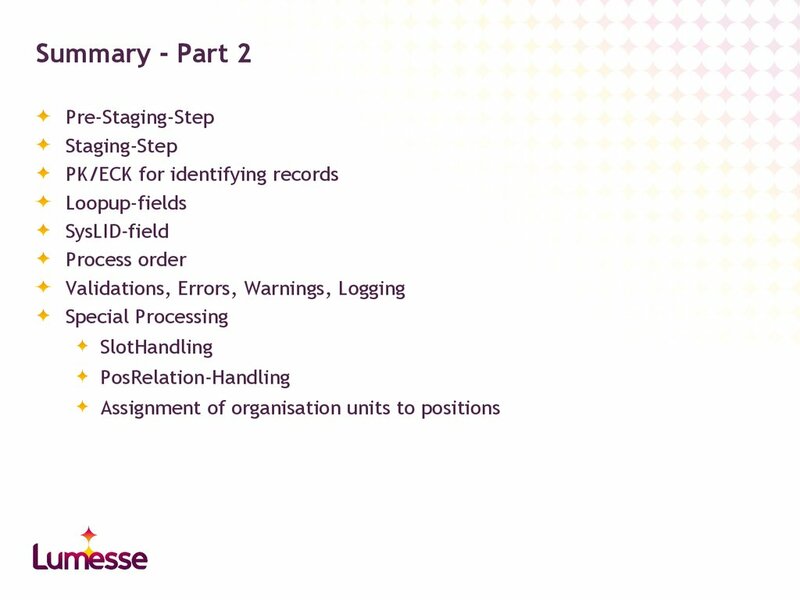 for the imported records in staging table tDTUPosRelation. with tPosRelation due to Pos-Pos. 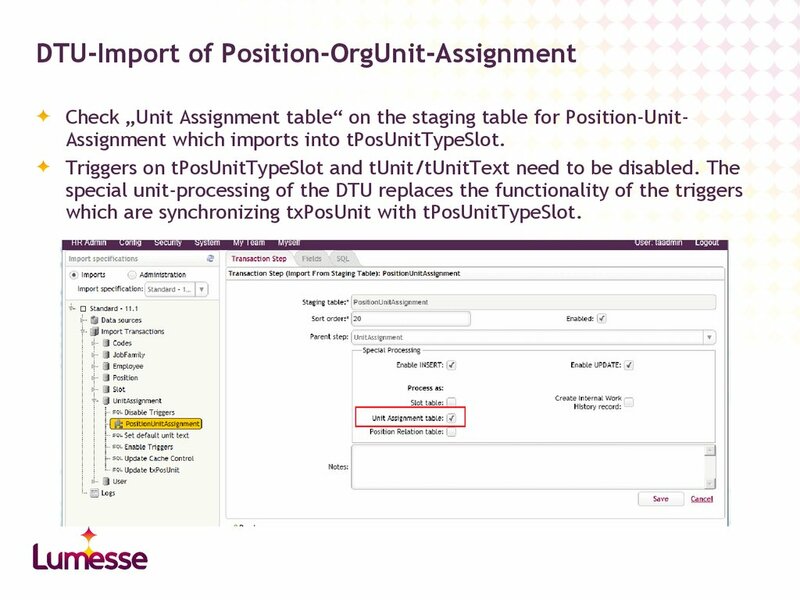 Check „Unit Assignment table“ on the staging table for Position-UnitAssignment which imports into tPosUnitTypeSlot. 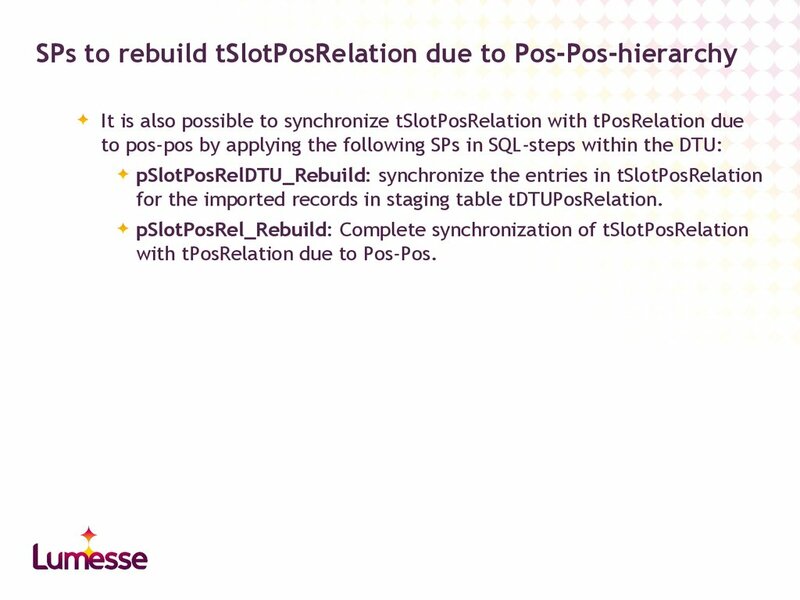 which are synchronizing txPosUnit with tPosUnitTypeSlot. units in the same staging table. 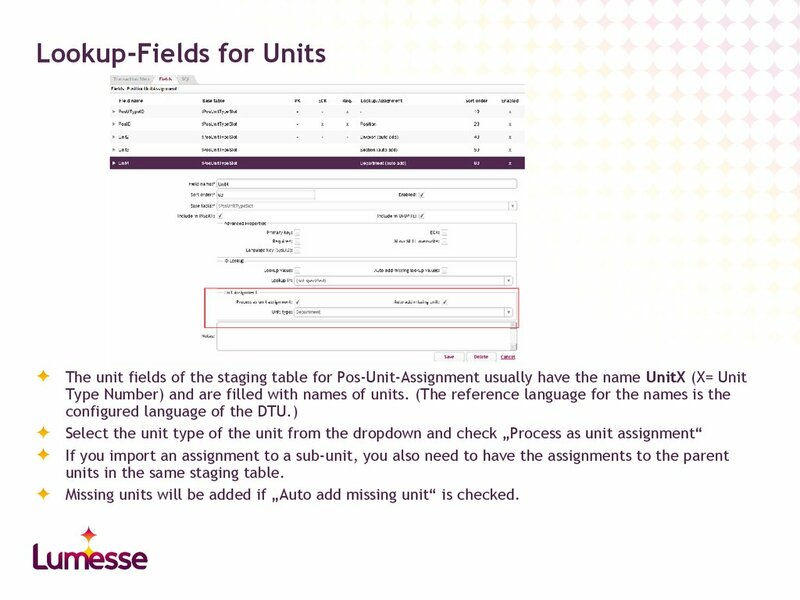 Missing units will be added if „Auto add missing unit“ is checked. /DTUCfgID=: ID of the DTU to be executed. /build: Staging and Pre-Staging tables are created. 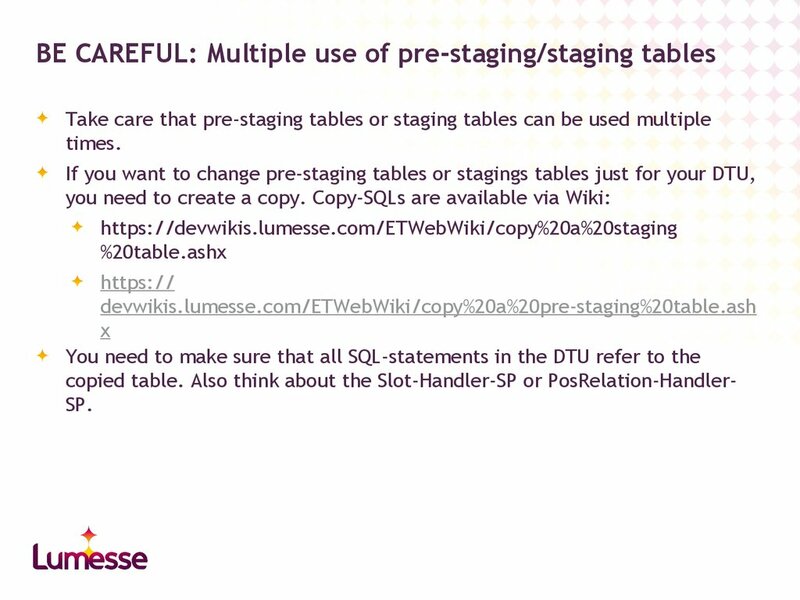 /import: Pre-Staging-Tables are populated from data sources. 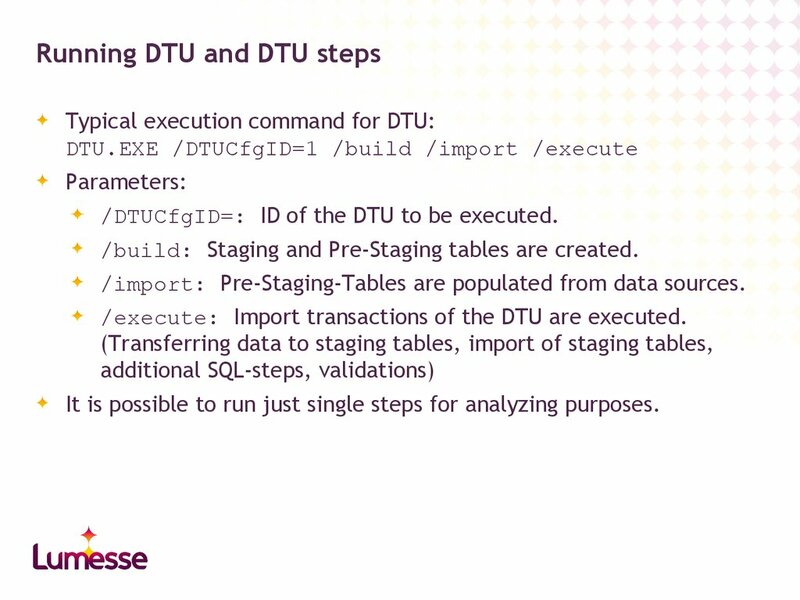 /execute: Import transactions of the DTU are executed. It is possible to run just single steps for analyzing purposes. 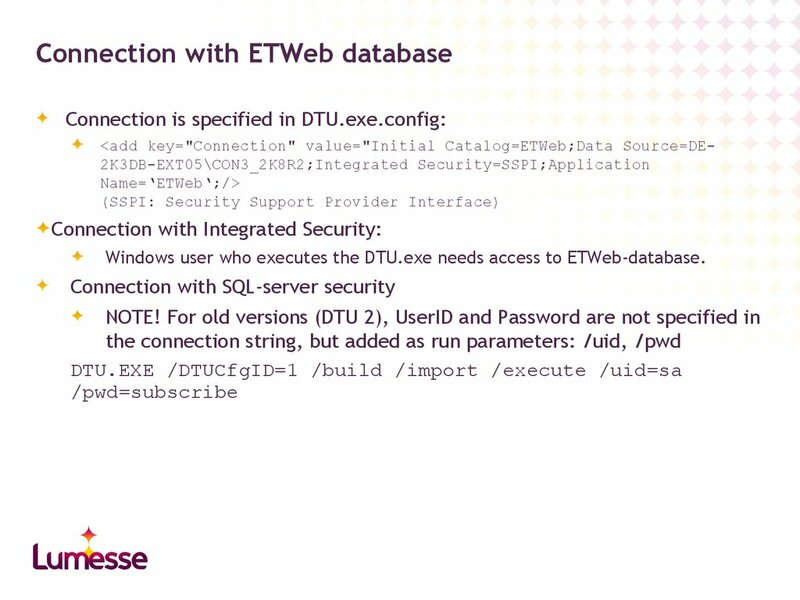 Windows user who executes the DTU.exe needs access to ETWeb-database. Take care with the setting Allow NULL overwrite! table, the data field will be overridden by NULL! the field for the import. DO NOT FORGET AND CHECK PROPERLY! May be useful and time-saving as it is not required to add the values of codetables manually. 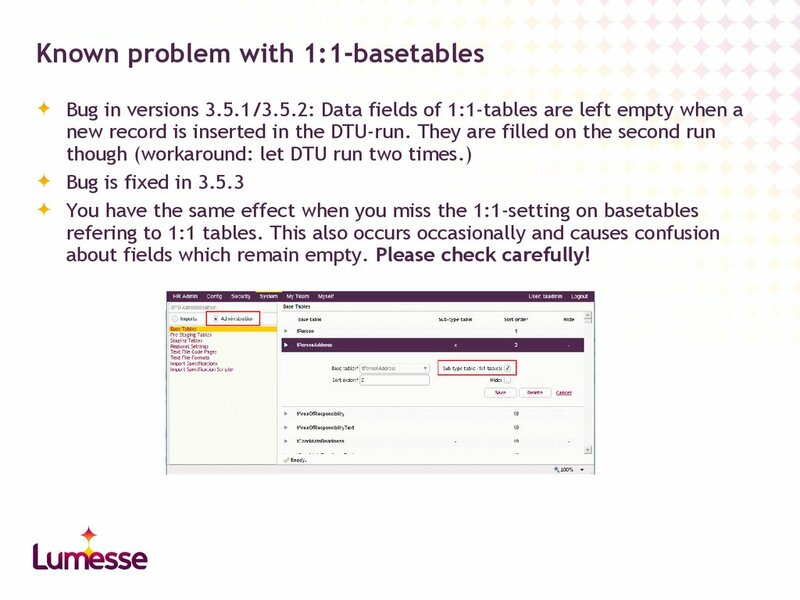 Errors due to missing code values can be avoided. multiple code table entries with the same functional meaning otherwise. consultant may ask for it, explain the problems that this will cause. copied table. 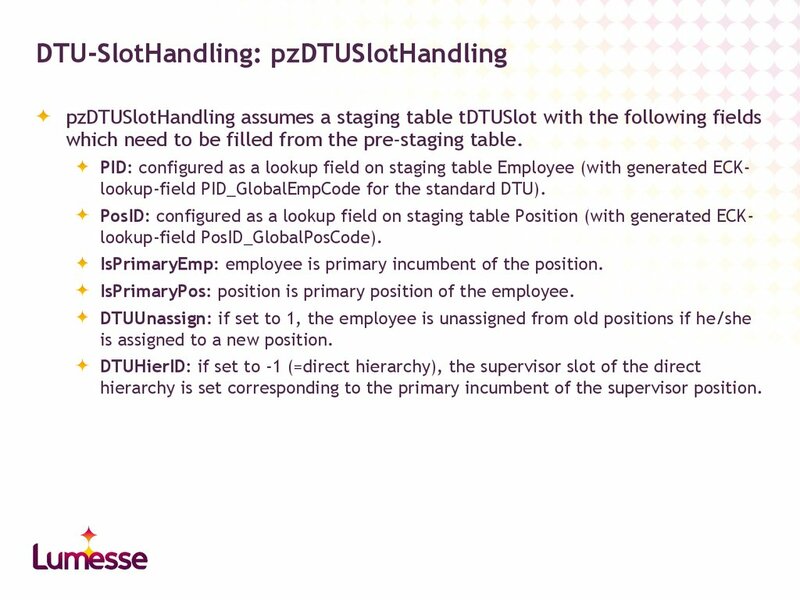 Also think about the Slot-Handler-SP or PosRelation-HandlerSP. 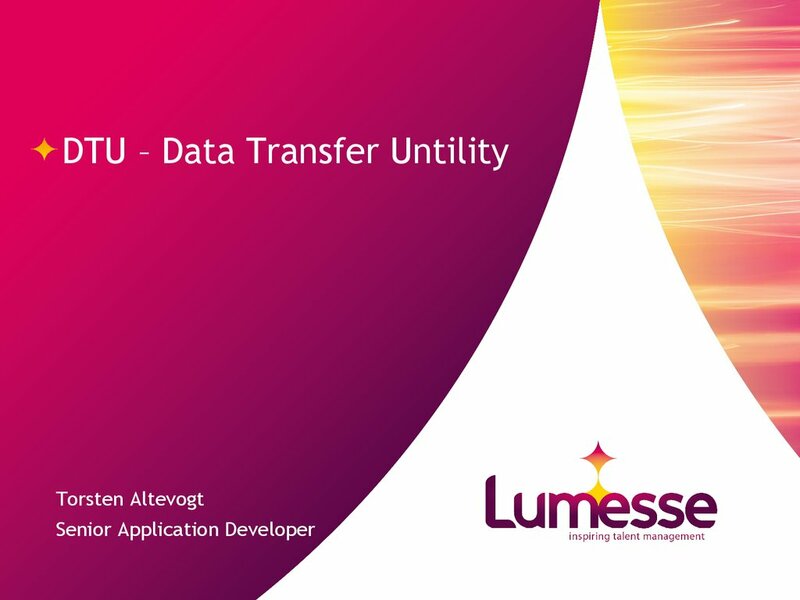 are run before the DTU-transaction and are not included in the DTUtransaction. BEGIN TRY….END TRY with empty CATCH. 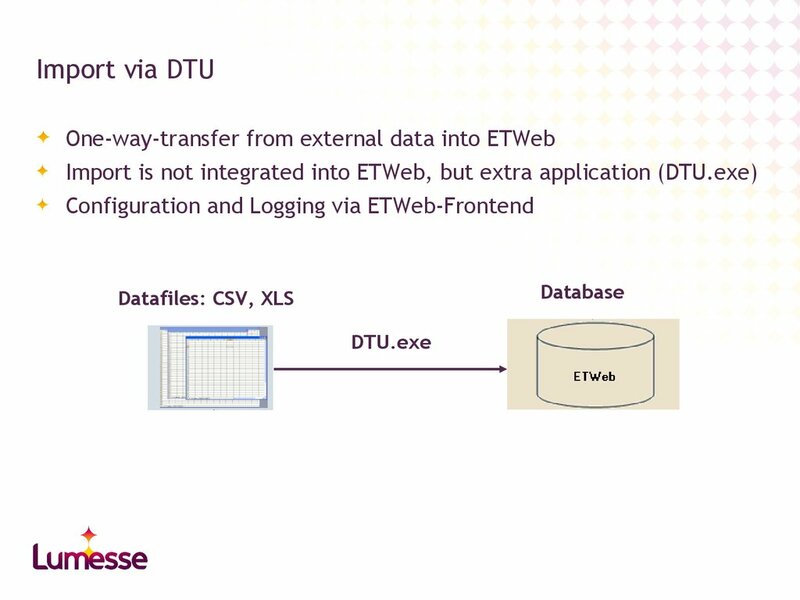 the error did not appear in the DTU-log. the stored procedure. Later it turned out that the data was incorrect. Field need to occur in the data source. Field need to be filled. and advice the consultant to forward to the customer. imported with the number of records with warnings/errors. Displays the number of imported/updated records in basetables. data. 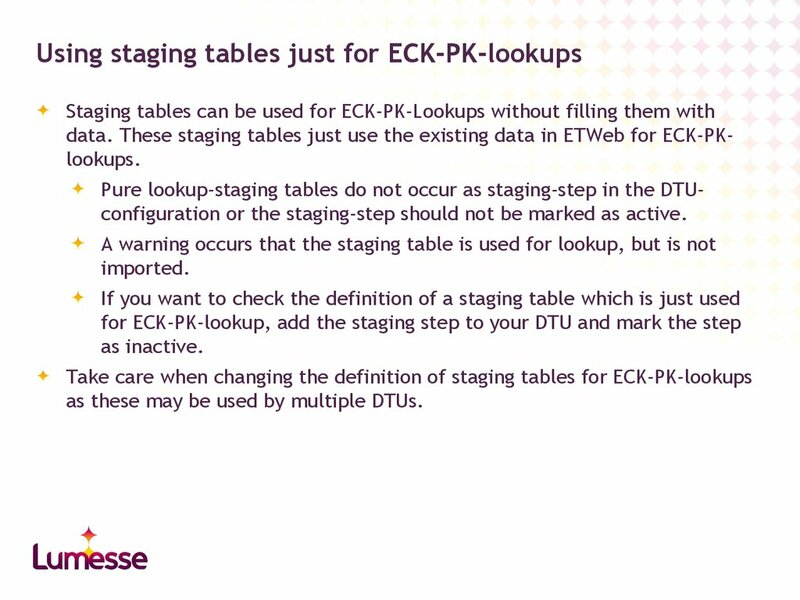 These staging tables just use the existing data in ETWeb for ECK-PKlookups. 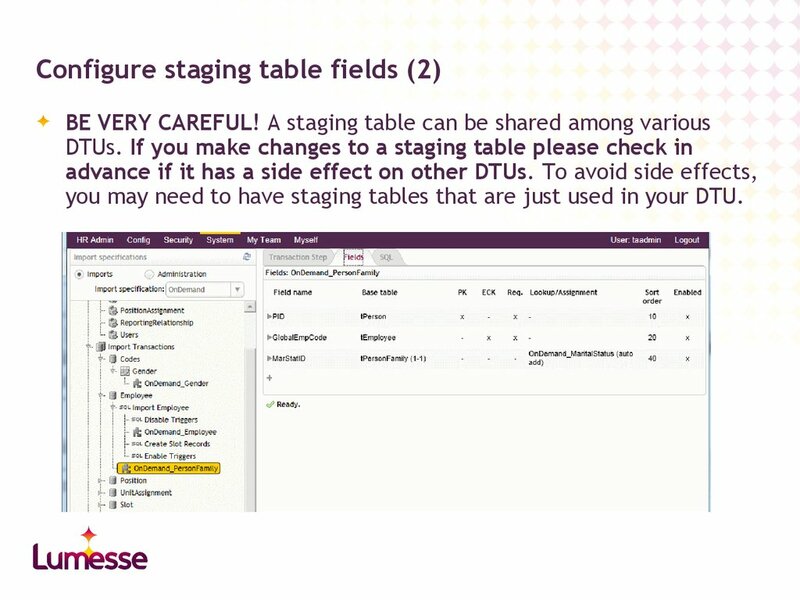 Pure lookup-staging tables do not occur as staging-step in the DTUconfiguration or the staging-step should not be marked as active. as these may be used by multiple DTUs. also if errors occur that will abort the DTU-process. 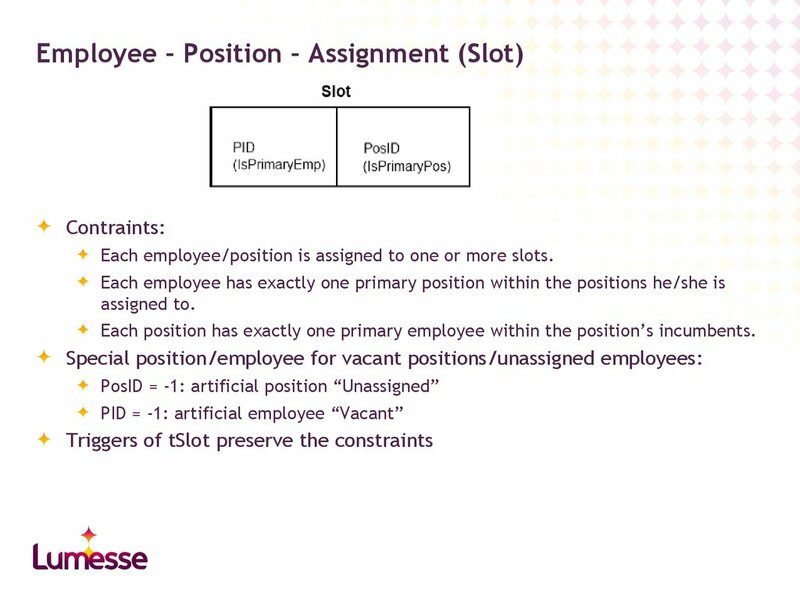 Ensure that each position/employee is assigned to a slot. Dummy slot (SlotID=-1, PID=-1, PosID=-1) is ensured. Update of table txPosUnit due to tPosUnitTypeSlot. Set EndDate of DTU-run in tzDTULog. mode as they may be enabled via the DTU-finalize. 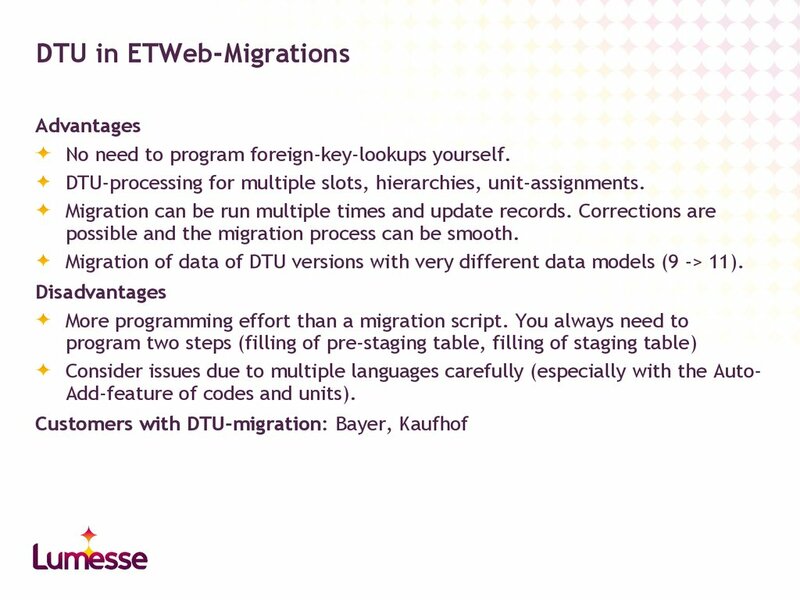 Customize your own final processing if required (take care with DTUmigrations as customizings may be lost.). about fields which remain empty. Please check carefully! 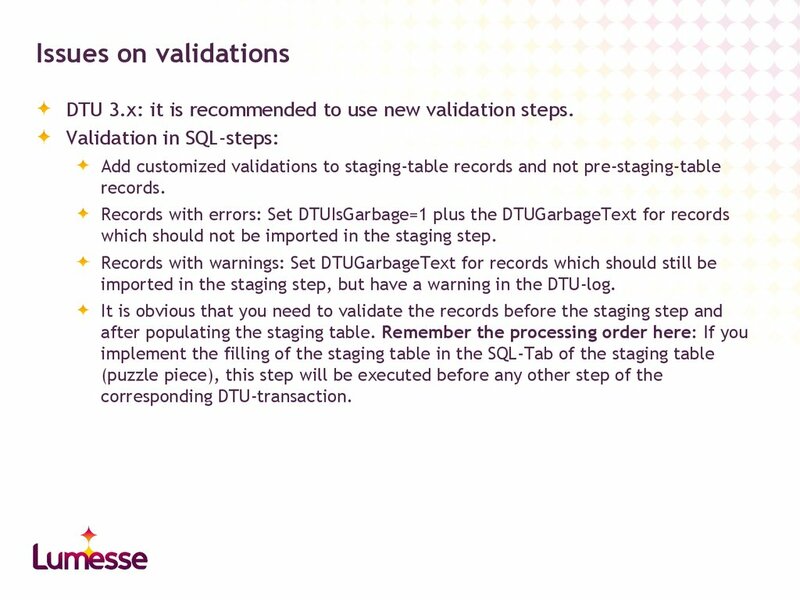 DTU 3.x: it is recommended to use new validation steps. which should not be imported in the staging step. imported in the staging step, but have a warning in the DTU-log. 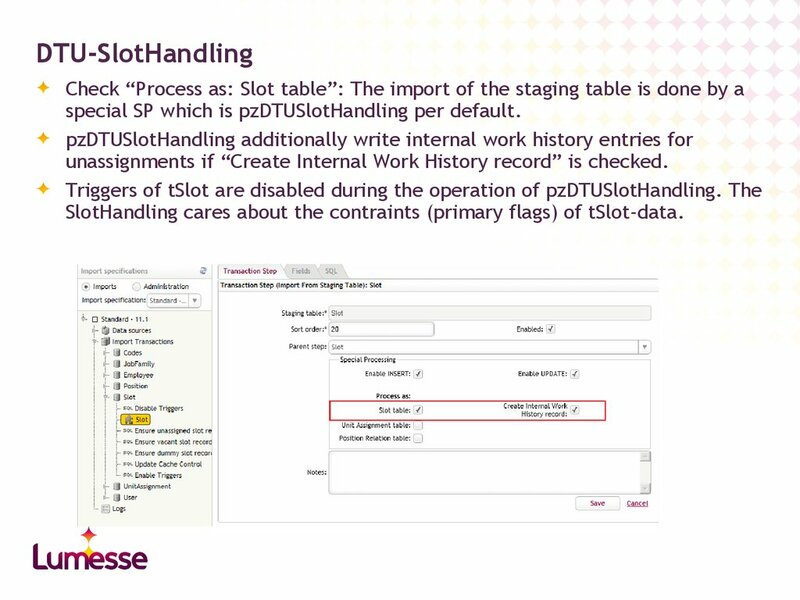 Configure timeout for populating pre-staging tables. fields are marked as garbage and not imported. marked as garbage and are not imported (default before 3.5.3). as garbage and are not imported. and are not imported (default before 3.5.3). will not be notified about multiple records that fit! 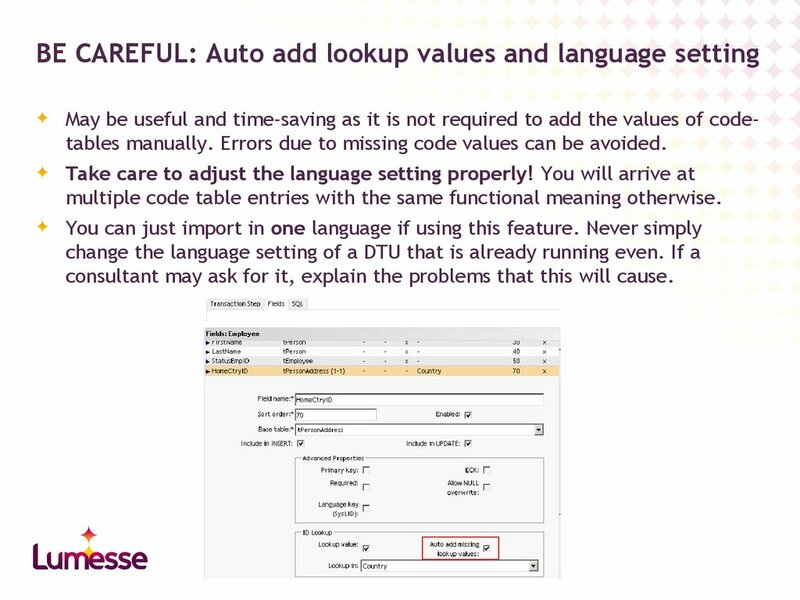 Import language: Especially important if Auto-Adds of codes and org. units should be used. 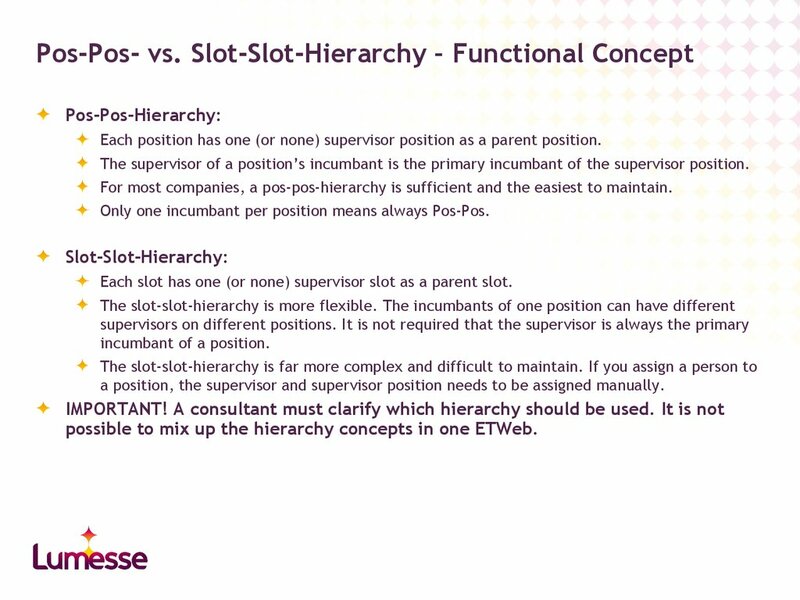 It need to be absolutely clear if the customer uses pos-pos-hierarchies or slot-slot-hierarchies. Lookups of codes/units: Auto-Add is activated or not? Do not decide that yourself! ECKs need to be clear. Required fields need to be clear. Sample files with filled fields are available on project start? Responsibility for additional technical support (support of technical consultant available?). 74. 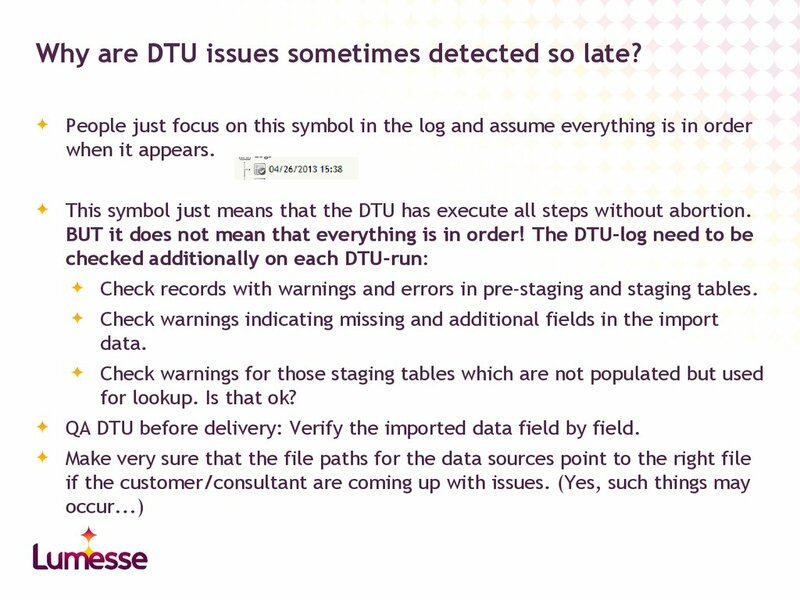 Why are DTU issues sometimes detected so late? This symbol just means that the DTU has execute all steps without abortion. 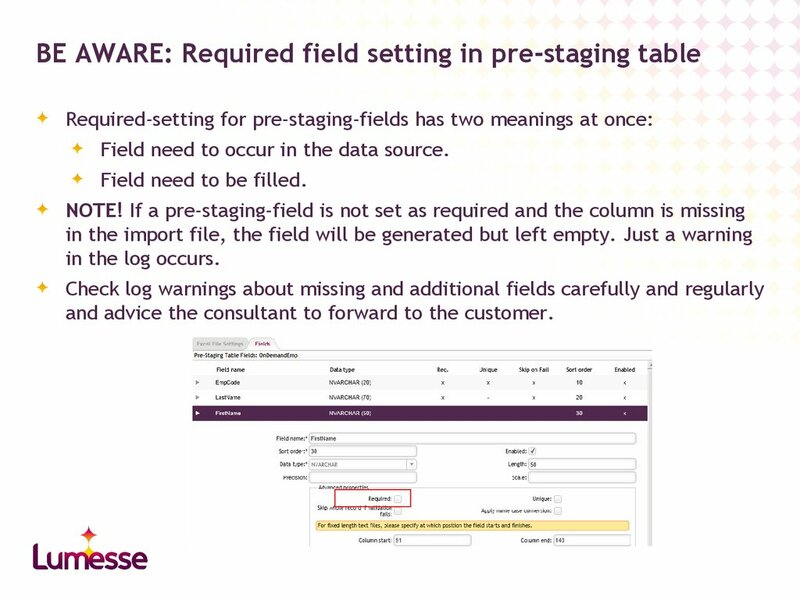 Check records with warnings and errors in pre-staging and staging tables. for lookup. Is that ok? 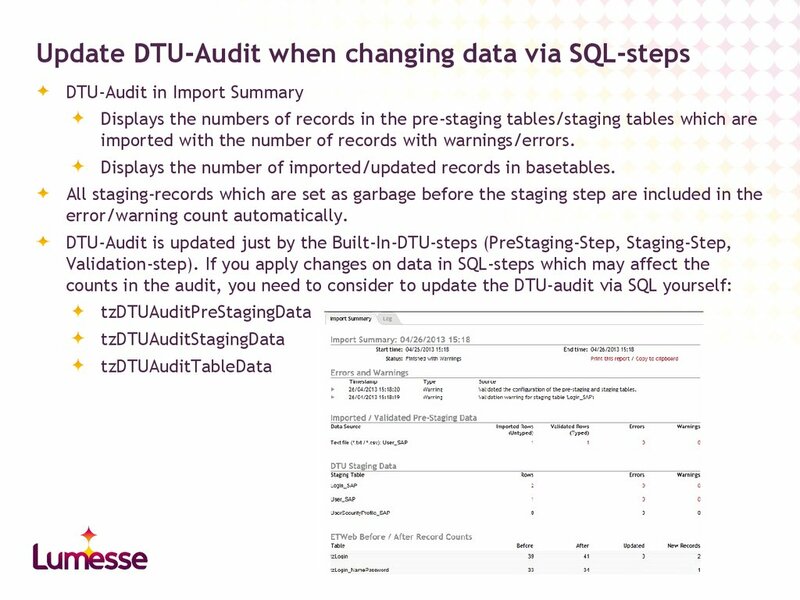 QA DTU before delivery: Verify the imported data field by field. 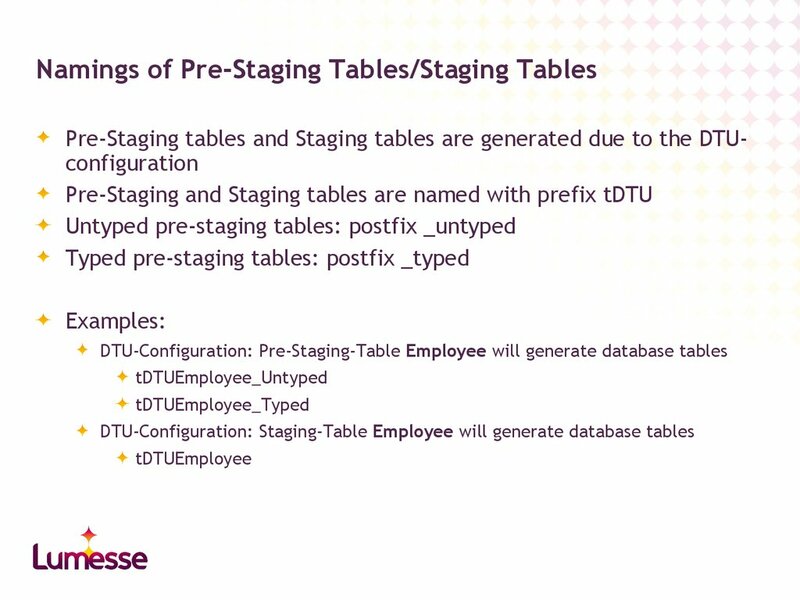 Define data sources of type Other for the pre-staging tables. 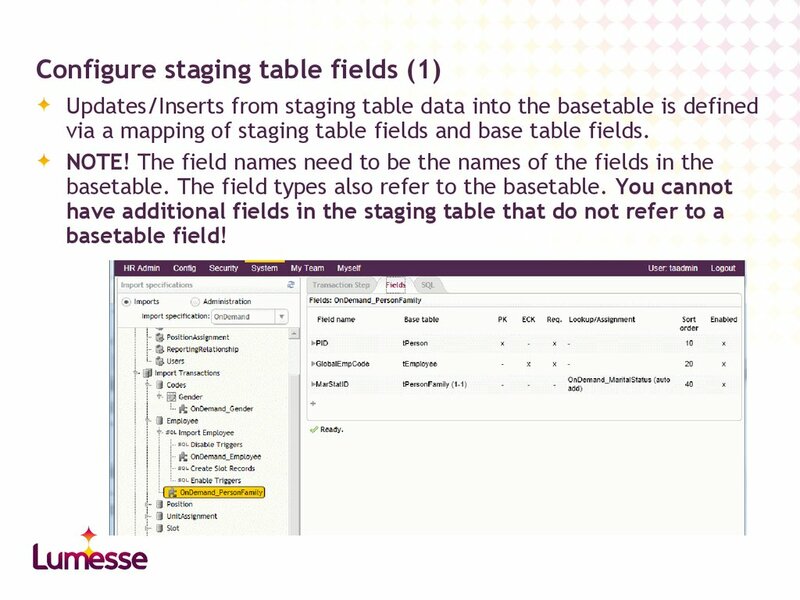 Fill the typed pre-staging tables from the source database. 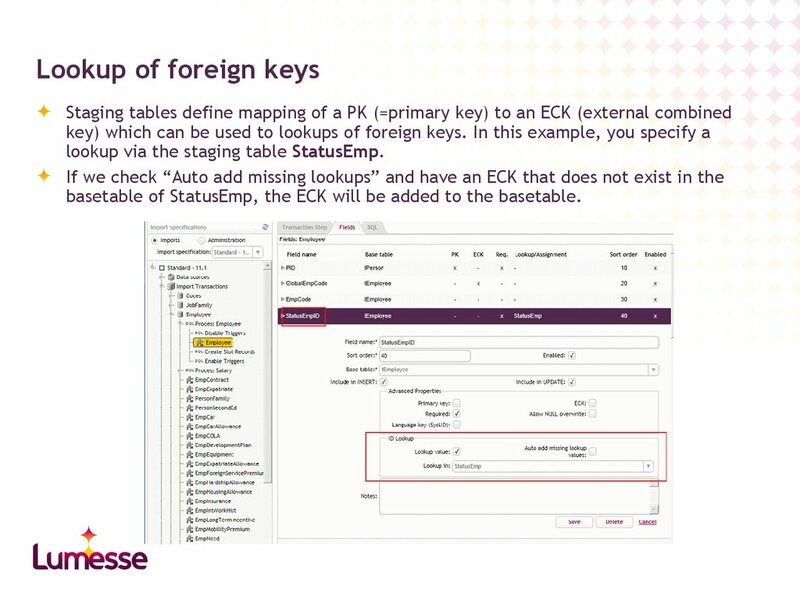 No need to program foreign-key-lookups yourself. 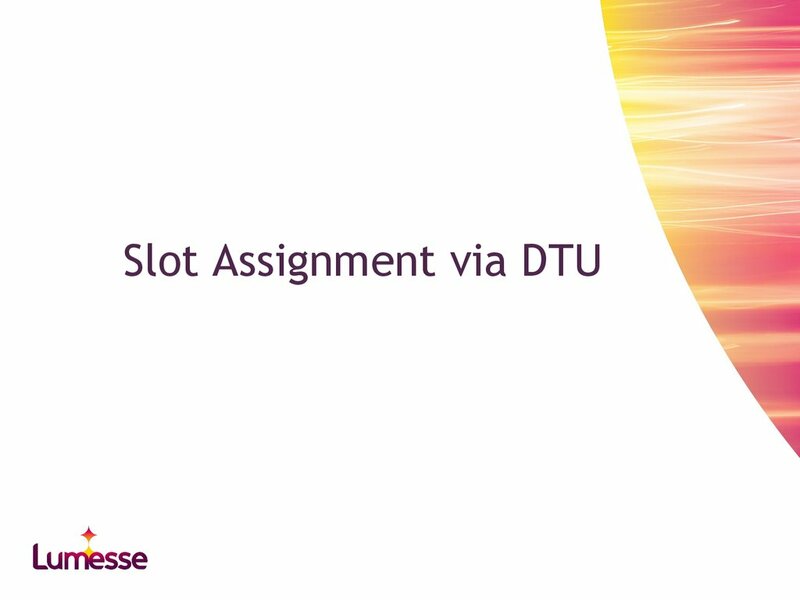 DTU-processing for multiple slots, hierarchies, unit-assignments. 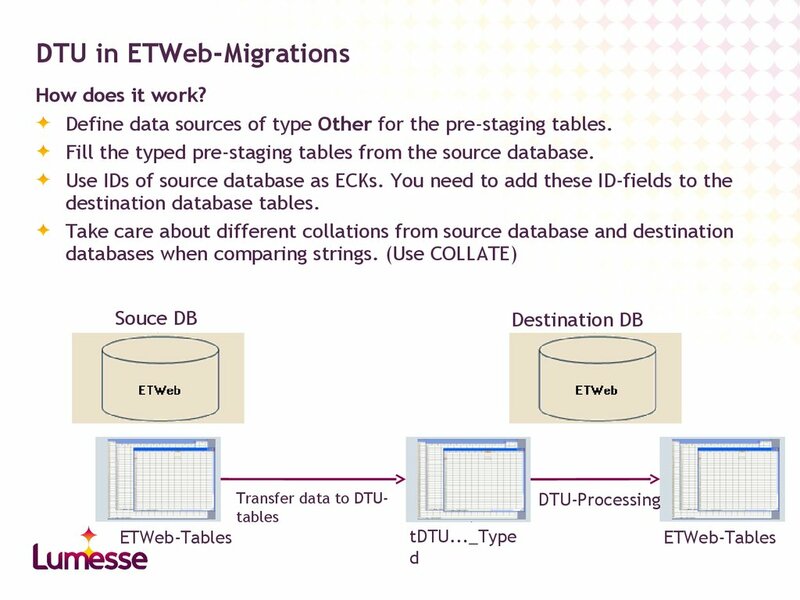 possible and the migration process can be smooth. 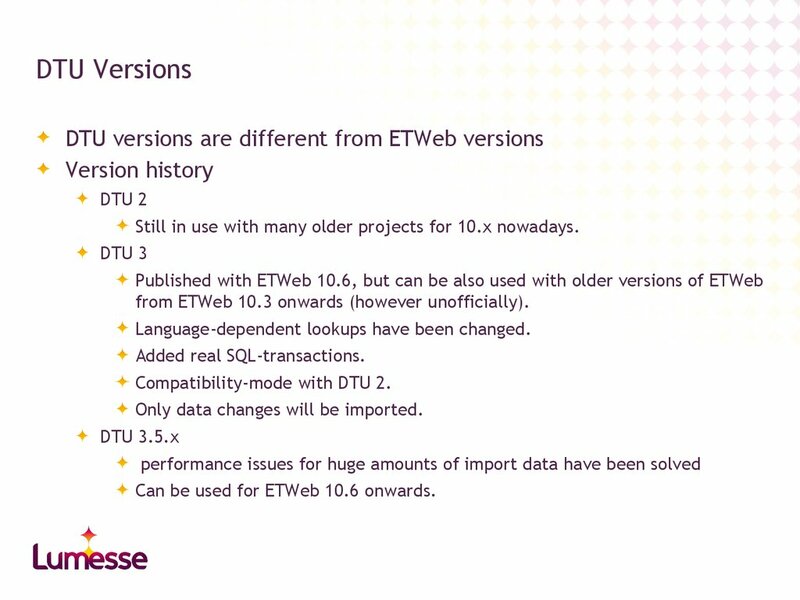 Migration of data of DTU versions with very different data models (9 -> 11). 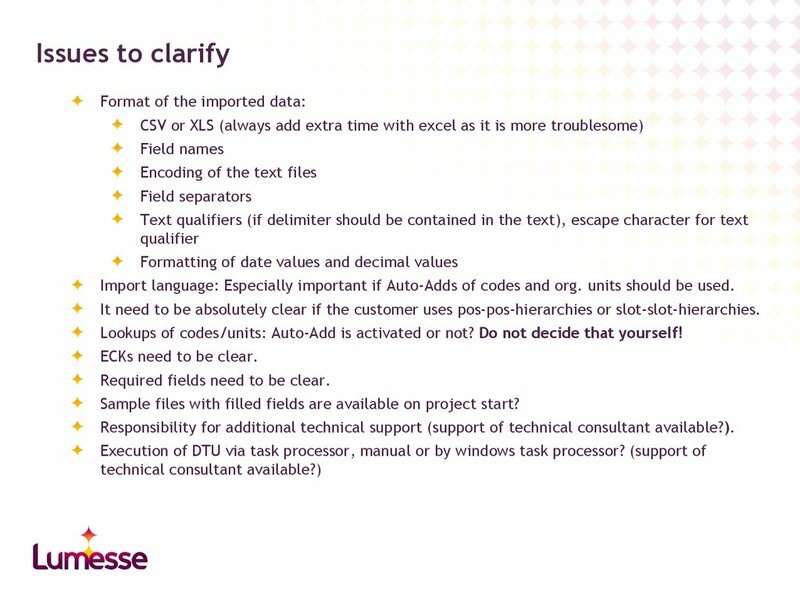 Consider issues due to multiple languages carefully (especially with the AutoAdd-feature of codes and units). 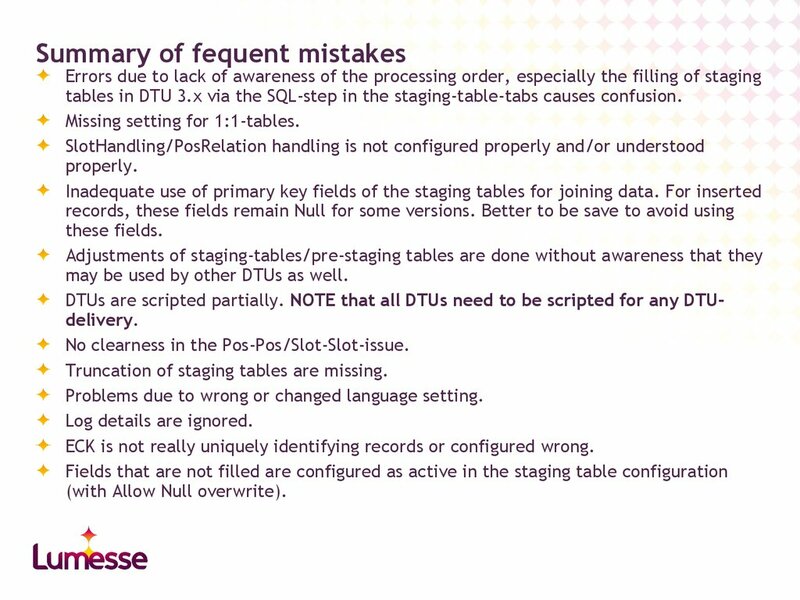 tables in DTU 3.x via the SQL-step in the staging-table-tabs causes confusion. may be used by other DTUs as well. DTUs are scripted partially. NOTE that all DTUs need to be scripted for any DTUdelivery. No clearness in the Pos-Pos/Slot-Slot-issue. Truncation of staging tables are missing. Problems due to wrong or changed language setting. ECK is not really uniquely identifying records or configured wrong.